All the tastes hang out with gluten. It's my favorite food group. Since I am back at the gym and reminded that I should eat better by everyone there, not personally but just by looking at how fit they all are, I decided to adjust some of my grocery shopping. 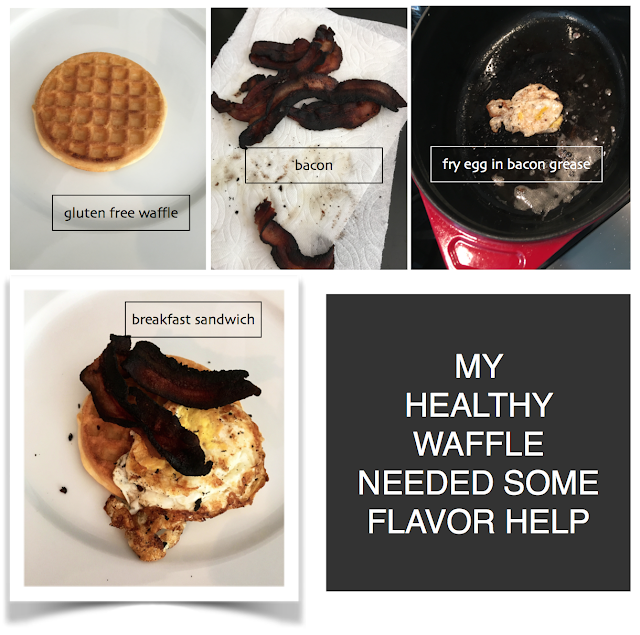 Yesterday I bought gluten free waffles for breakfast. Low in sugar and with an ingredients list that's made up of things I know. I made one this morning. I took a bite. I decided it needed flavor. The result may not be what was intended by well meaning folks. Dude. Stop. Nothing good comes of eating gluten-free. All or nothing, my friend. Beth- You're a wise one. I love my gluten and carbs but I eat organic bread and here and there a good piece of cake but the expensive kind so I don't buy it often:-) Life is too short to give up my carbs! unless you have been diagnosed with celiac disease or are medically documented as gluten-sensitive, there is no reason to eat gluten-free. it's not healthier. in fact, they add things in to make up for the lack of gluten, so many times it has more calories. and it usually tastes blah. eat the gluten!